Constructed of high-impact, white polyethylene. Universal - Fits all Medline commodes. Complete with handle and lid. 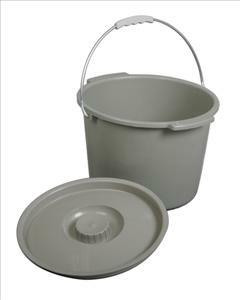 Diameter of bucket is 11".12-quart/ 2-gallon capacity. Limited lifetime warranty on frame. Six month warranty on handles, feet, seat & lid, push buttons, "wearable" parts. With Lid and Handle.